A 5-minute game by Jason Rohrer highlighting the difficult choices a person makes in the course of one lifetime. The game uses a 100×16 pixel screen and 8-bit style graphics. 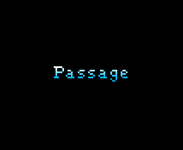 Passage may be downloaded for free.